Many of us will be breaking out the corned beef for St. Patrick’s Day. It seems to be as much of a tradition as green beer and Irish soda bread. But is it really associated with the Irish at all? This is something I thought was true. But is it? Corned beef is cured with "corns" of salt. Curing meat with salt is a very old culinary technique, dating back to the murky ancient times of both Europe and the Middle East. corned beef linked just below. Corned beef really took off during the British Industrial Revolution, being a product that could be transported and used not only as food for long sea voyages but also as a trading commodity once port was made in North, South and Central America. Corned beef is thought to be traditional Irish food by North Americans. Corned beef is served in Ireland, but many Irish see it as a tourist commodity and not innately “Irish.” In Ireland pork is more commonly consumed than beef, and many view our North American association between Ireland and corned beef as crazy. 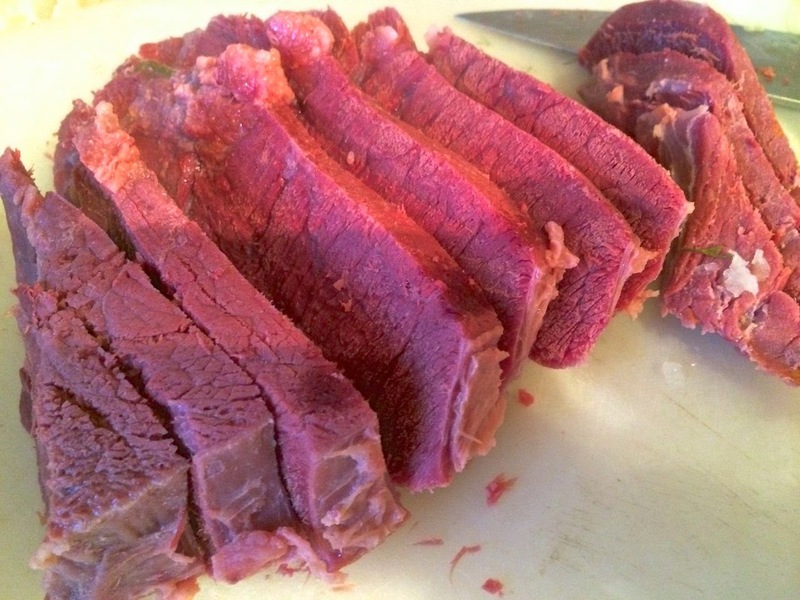 The most famous salted beef is kosher brisket, from the Jewish culinary tradition. It is widely believed that corned beef in America was eaten by the Irish because it was readily available to purchase from their Jewish co-immigrants. Both groups had large populations in New York City in the mid-1800 and 1900s. So the association probably has more to do with commerce than culture. I recently read an excerpt from a “letter to the editor” by an Irish-American lady commenting on an article about the Irish-ness of corned beef. She grew up in Queens, NYC in the early part of the 1900s. From her recollection its consumption was actually made popular by New York bars. Bars offered a “free lunch,” consisting of corned beef, to Irish construction workers working on NYC skyscrapers. But the workers had to buy beer or whiskey to get the free lunch. Over time, corned beef became associated with the Irish in the USA. So the desire to serve corned beef on St. Patrick’s Day because it’s Irish is, at the end of the day, a load of blarney. But it is tasty – if highly salty. So if you’re of the mind to serve up a chunk of the brined, pink delight, what follows is a very traditional Nova Scotia recipe. Just be warned, the pink colour comes of curing with sodium nitrite, which turns some people off. I have a recipe for making corned beef without nitrites here. This recipe is how my mother made it, and probably her mother before her, and her mother too. So this stretches back into the late 1800s. Some cooks soak the corned beef before cooking to remove some of the salt, others do not. This dish takes very few ingredients, so is not expensive to make. 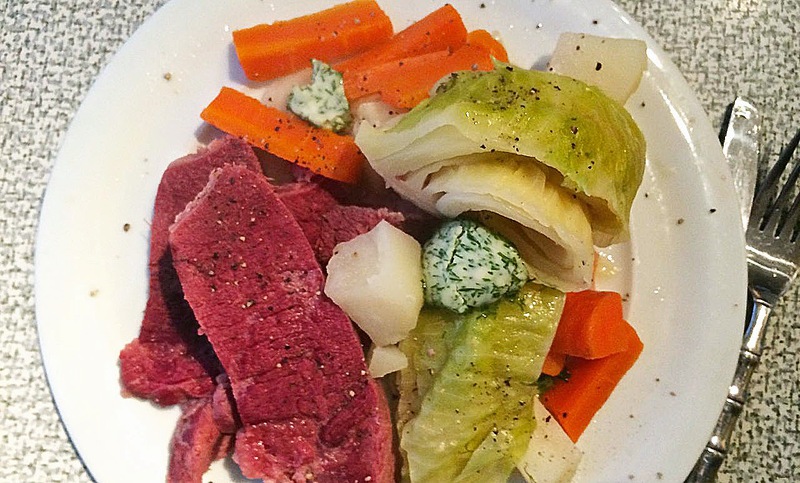 Vinegar sprinkled on the beef and cabbage is a standard condiment with corned beef in many Nova Scotia homes. Rinse the corned beef and place in a heavy pot with a well fitting lid. Add just enough water to cover the beef. Add the black pepper and bring to a boil. Reduce the heat to medium low, cover and let cook for 2 hours. 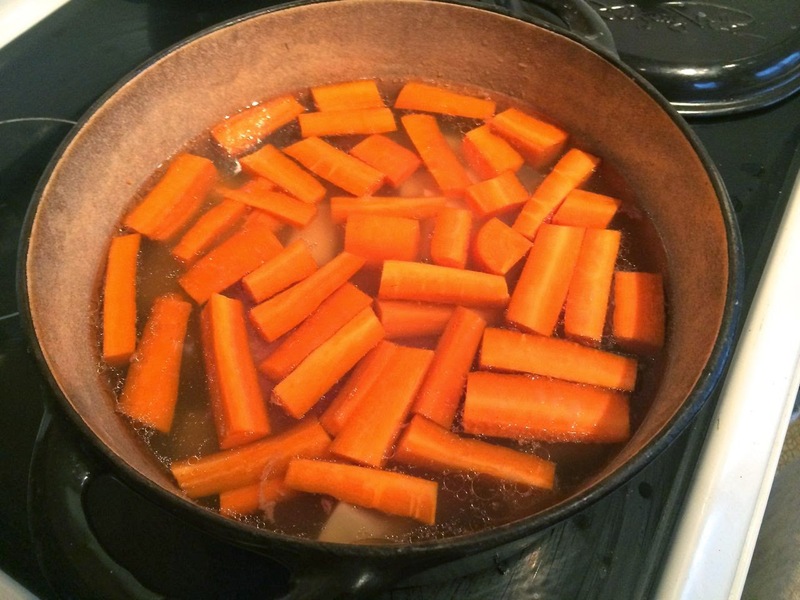 While the meat cooks, peel the potatoes and carrots and cut into large pieces. Core and cut the cabbage into eight wedges. After the 2 hours, add the potatoes and carrots. Bring the heat up to medium high, cover again and cook for 15 minutes. 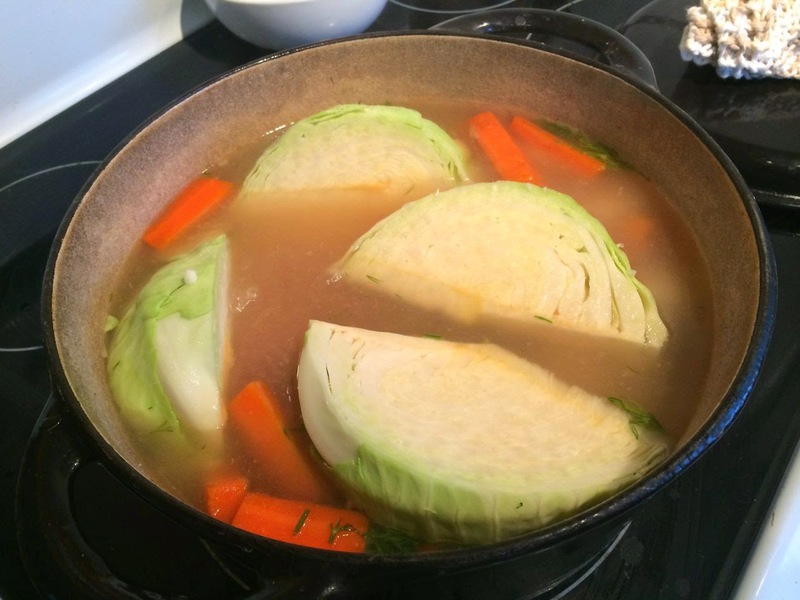 Then add the cabbage wedges, re-cover and cook for an additional 10-15 minutes. Remove the beef and slice against the grain. Serve with salt (taste first!!!) and white vinegar at the table.